doc·tor - /däktər/ - noun - a qualified practitioner of medicine; a physician. From the Latin verb docēre [dɔˈkeːrɛ] 'to teach'. Physicians are teachers, advocates, and leaders in their communities. Family medicine physicians are uniquely suited on the front-lines of medicine to advocate for measures that can improve overall health outcomes. They also play an integral role in shaping health policy for their local communities. 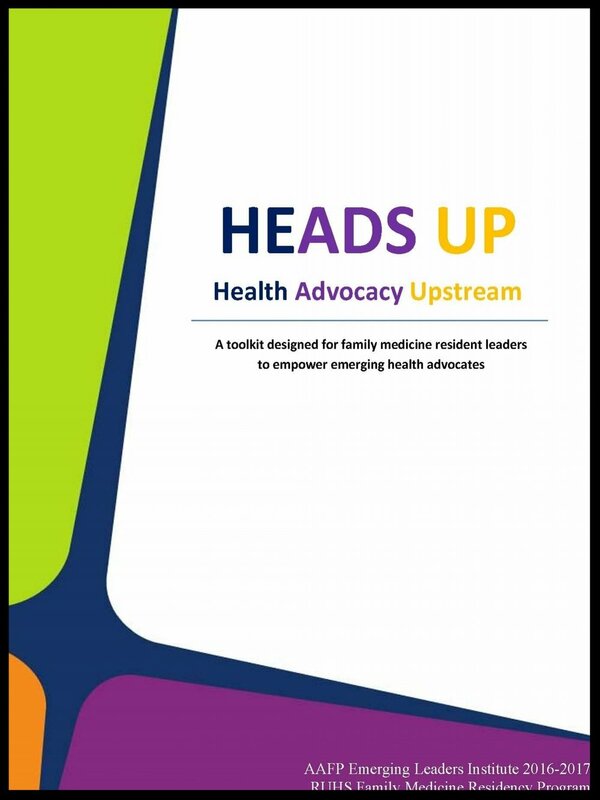 Our program helps resident physicians develop advocacy leadership skills through a structured teaching setting, while strengthening ties to their local community. True physician wellness comes from a balance in life with enhanced mental, physical, and professional well-being. Our program gives residents a strong sense of personal accomplishment through active community outreach. We provide several humanities resources and examples to help residents enhance all aspects of their well-being. This program was sparked into creation at the 2016 Emerging Leaders Institute, a scholarship of the Family Medicine Leads / AAFP Foundation. We encourage resident physicians and medical students to explore grant and scholarship opportunities at local, state, and national levels to promote and expand their ideas.